Our gallery has been updated with more production images from The Beguiled! We were missing a few stills, which have now been added, and we’ve also uploaded two new images from the latest issue of Harper’s Bazaar – they seem to be from a collodion process photoshoot, meant to look like old photography. Have any of you seen the movie yet? How did you like it? While attending the Miu Miu Fashion Cruise in Paris a few nights ago, Elle talked to WWD about her upcoming movie Teen Spirit, set to be directed by Max Minghella. 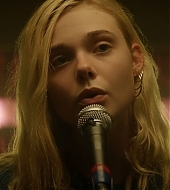 She plays an aspiring pop star who enters an international singing competition. 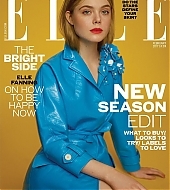 Elle Fanning is getting ready to test her pipes. “Yes, I sing. It’s something that people are kind of surprised by because I haven’t gotten to utilize it,” the 19-year-old actress said Sunday night at the Miu Miu show, whose soundtrack included such singing actresses as Marilyn Monroe. Guests including Stacy Martin, Gwendoline Christie and Anna Brewster marveled at the venue, the Automobile Club de France, with its gilded rooms overlooking the Place de la Concorde and a vast library where the cabaret-style fashion spectacle took place. “They said the first car in the world is here — somewhere,” Fanning noted. Elle is in Paris! She attended a couple of Miu Miu events today – she was first photographed upon arriving at the brand’s Fashion Show, and then inside their private dinner. Our gallery has been updated with the images! Elle was photographed before catching a flight at LAX Airport yesterday, and then again after arriving at CDG Ariport in Paris, France. Our gallery has been updated with both sets of images. Elle was spotted catching a ride with her grandmother earlier today. Our gallery has been updated with the pictures! I also have several screen captures from interviews coming your way, so keep an eye on our page! Elle is this week’s cover of Madame Figaro! She had been featured in the magazine recently on a spread about The Beguiled and Cannes Film Festival, and now she’s sneaked her way into their cover. They have released what seems to be the entire article about Elle on their website, but, naturally, it’s in french. Anyway, we’ve updated our gallery with the two covers, as well as a couple of images from the photoshoot. Elle was photographed yesterday while out and about in Studio City. Our gallery has been updated with the images. Our gallery has been updated with scans from the July issue of Empire, which features a fairly long article about Elle’s latest film, The Beguiled. I’ve also uploaded scans from several other magazines released this year, such as The Hollywood Reporter, Variety, Elle UK, Vanity Fair and more. Most of them are high quality, so you can easily read the articles. Elle has been invited to become a member of The Academy of Motion Picture Arts and Sciences! The institution announced on Wednesday that it’s inviting 774 new members — a record-breaking number. Other actors on their list include Domhnall Gleeson, Gal Gadot, Chris Hemsworth, Shailene Woodley and many more. Elle’s older sister, Dakota Fanning, holds the record for the youngest actress to ever join it, having been invited at the age of 12. You can check the complete list of new Academy members on Variety.